Hareclive E-ACT Academy are absolutely delighted with their new Reading Oasis, thanks to Ablaze and United Way UK. Sally Ridley, Ablaze’s Primary Partnership Manager, nominated Hareclive E-ACT Academy for a United Way Reading Oasis, as the school has a high proportion of children receiving Pupil Premium Funding, with over 70% of pupils at the school entitled to Free School Meals, compared to a national average of 14%. The school also desperately needed new books and facilities in which to enjoy them. Sharon Jones, the Reading Recovery Lead at Hareclive E-ACT Academy, was absolutely thrilled when the school was selected to receive a Reading Oasis. 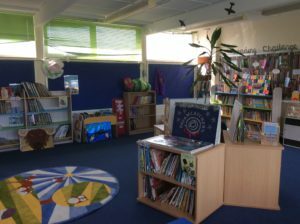 Thanks to United Way UK, the school’s library now has hundreds of new books, new bookshelves and comfortable seats for the pupils to sit down and enjoy a book. The United Way Reading Oasis scheme aims to provide safe and inviting spaces within schools where children can enjoy reading and gain access to brand new books, while learning how to make reading a habit at home. The United Way Reading Oasis scheme is funded by donations from companies and individuals, and schools with a high proportion of children receiving Free School Meals – especially those schools with an inadequate library or no library at all – are given priority. Please see United Way’s website for more details about the scheme. Ablaze is a registered charity which wholly relies on business support & donations to be able to continue its work across Bristol & South Gloucestershire supporting young people with their learning. If your business would like to get involved with volunteering, or to fund raise or donate to this worthy charity, please email enquiries@ablazebristol.org to find out more.